Located about a 40-minute drive north of Detroit, Rochester Hills is home to roughly 70,000 people, a variety of industries and a number of recreational facilities. Tennis, golf, skiing, swimming, jogging, bicycling, boating or fishing – Martinez had plenty of sports and leisure activities to pick from. It was hockey, however, that topped his list early on. Those evenings weren’t just about ice. There was, on occasion, ice cream, too. “Hopefully, you got to make the trip to the Dairy Queen in town those nights,” offered Martinez. Or to another one of his favourite spots in Rochester Hills. One of those places is Lipuma’s Coney Island, a roadside restaurant specializing in hot dogs. The list of offerings includes the Texas Dog (BBQ sauce, coleslaw and pickle spear), New York (sauerkraut, mustard and onion) and Combo Dog (loose ground beef, chili, mustard and onion). Yates Cider Mill is another popular destination for Martinez. A Michigan landmark and designated historical site, Yates has made apple cider with water power from the Clinton River since 1876. 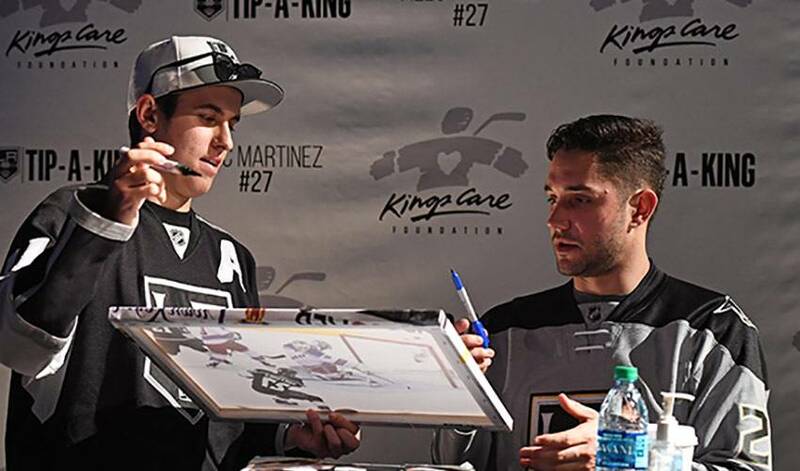 “I always enjoyed going to eat at my favourite place in town, Lipuma's Coney Island, going to the Yates Cider Mill in the fall, or walking around downtown at Christmas time when all the lights cover Main Street,” said the 95th overall pick of the Kings in 2007. When he wasn’t taking in the sights and sounds of Rochester Hills, Martinez was busy making a few dollars through various part-time jobs he had as a teenager. If you don’t see the now 29-year-old arguing a referee’s call very often these days, there’s a pretty good reason why. “I always did typical things of a teenager looking to make some extra money,” recalled Martinez. “Usually things for my neighbours like babysitting or yard work. My neighbour across the street was a part of the Bordine family. Bordine's is a large nursery business in the Detroit area and their commercial was always shot at their house. Needless to say, they had a lot of plants and landscaping and having to weed all of that taught me hard work. What is easy, however, is for Martinez to remember what Rochester Hills means to him. “Some of my best memories and favourite places in my hometown always involve my friends and family,” he said.